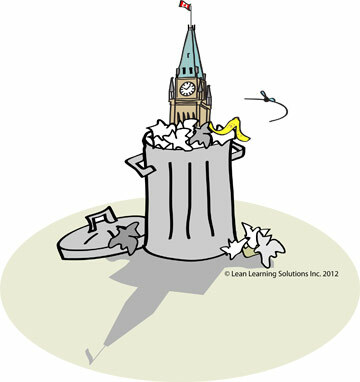 Lean Thinking: Government – the Land of Waste? Government – the Land of Waste? Canada's legal system is in crisis. The Seven Deadly Wastes -- delay, over-processing, errors, inventory and so on -- are reportedly at epidemic levels. Are things any better in the US or UK? My American & British chums tell me it's pretty much the same in their countries. What's the effect of all the waste in Canada's legal system? Cases are being thrown out of court because of excessive delay. Bad guys are getting away with theft, assault and worse. Can we apply Lean principles to 19th century institutions such as government and its affiliates? And it's corollary: Can we engage civil servants in continuous improvement? In my view, we have no choice -- good governance is more important than ever. Governance, in my view, has always been the "secret sauce" of Western democracies. As inept as our governments have often been, the alternatives were always much worse. Historically, we've been able to muddle through, doing just okay, while avoiding the worst. Given our competitive challenges, Is muddling through good enough today? Contrary to popular opinion, I believe civil servants are, for the most part, honest and dedicated. Like most people, they want to do a good job. They deserve the right to pride in their work. But they're often trapped in antediluvian management systems that lack professional leadership and oversight. "How will we engage civil servants in continuous improvement?" Our safety, security and prosperity depend on it.